What color should I have my helmet painted? By in large the most common paint scheme seen on German helmets during the war was rough textured field gray. For anyone who wants the so-called standard German helmet, textured field gray is what I recommend. The German military did try to standardize helmet paint color during the war; however the color guidelines were never fully implemented. There were several reasons for this. Many of the companies who held contract to provide paint, were unable to fulfill their contract due to high demand and thus outsourced to other paint venders. 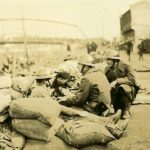 To complicate matters further military supply depots often re-painted helmets with whatever gray-green paint was available. 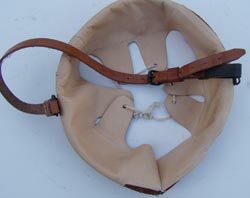 Anyone who has handled a large number of original helmets can a test to the shades of field gray varies greatly. 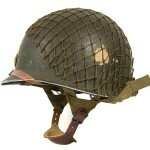 I personally have seen original helmet ranging from slate gray to olive to almost khaki. I currently offer three different shades of field gray. They vary from light to extremely dark. If you do want something more unusual let me know what it is and I will see what I can do. What texturing agents do you use in your paint? I use real aluminum oxide powder or saw dust on request. How do you age your helmets? I will not answer any questions about my methods. I have experimented for many years to come up with these techniques. I have used a lot of trial and error. I repainted my one of my M35s so many times my wife said she thought it would disintegrate from being stripped too many times. I will say one thing that makes me different then some of my competitors. I use natural means. I do not use paint or dyes to create the illusion of age. My methods are natural I do have a few tricks to speed the process up but I think you will agree the end result is must more convincing. What sort of paint do you use, can I buy some? I only use industrial oil based paint. The paint I use is the closest available to the German war-time manufactured paint. Some of it I mix myself, and some of it I have mixed for me The paint is very durable and will hold up well during a re-enactment, however if you drop your helmet or have it dinged some how, the paint will probably chip. Unfortunately I can not sell my paint. The law requires a haz-mat license which I do not have. What SS decal should I use? I offer both the SS 1st pattern (or Poucher decal) and the 2nd pattern. Both of these decals were designed in the 1930s and were used for the entire war. There are some people out there that think that if the helmet is a M35 it has to have a 1st pattern decal. This is absolutely not true. I have even seen a few pre-war photos of Allgemeine SS troops with 2nd pattern decals on their M18 transitional helmet. Generally speaking the 1st pattern is almost exclusively found on helmets made at both the Quist and Emaillerwerk. Many Eisenhuttenwerk helmets made in 1939 also seem to have 1st pattern decal applied to them, but then switch to 2nd pattern in 1940. 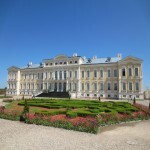 It is believed by some experts that both these factories held a contract with Poucher for decals. That being said decals were available for private purchase by soldiers. They could even be purchased at local drugstores. Soldiers and supply depots often re-decaled helmets. So it is possible to find an original M42 made at Eisenhuttenwerk with a 1st pattern decal. What’s a dome stamp; do I need one to be authentic? Dome stamps were rubber ink stamps that were stamped into the dome of the helmet by inspectors. They were stamped with either black or purple ink. 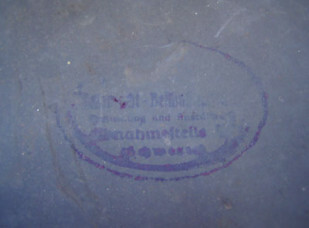 It is believed that only about 25% of helmets received this mark. Helmets made before 1939 were stamped with the year of production. In the later part of 1939 the stamps were no longer dated and instead were specific to whatever factory made the helmet. In recent years many on-line venders have began to sell plastic decals to replicate these stamps. This is completely erroneous no decals were ever used. I currently offer correct ink stamps that are dated 1937, 1938 and 1939. I also offer the post 1939 specific factory stamp to, Eisenhuttenwerk, Quist, Vereinigte Deutsche Nickelwerke and Emaillerwerk. 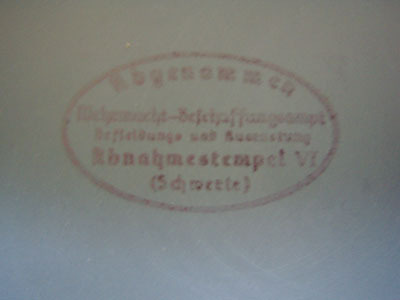 Helmet made at Sachsische Emaillerwerk rarely were stamped by inspectors, but I do offer the correct stamp forthis factory. I am the only restoration artist who offers these rare. What are a 1924/27 liner and chinstrap? I am proud to say I am currently the only vender out there that offers this rare liner and chinstrap for sale. In 1920s the Reichswehr started the long process of refitting all the old M16, M18 and M18 cutout with new liners. The liner was more or less an improvement on the M16 liner. The new liner retained the three pad system found on the M16 version but had steel D-rings riveted to the leather band to attach the new improved chinstrap. In fact it is probable that many of the existing M16 liners may have been modified to fit the new 1924 specifications. The M1924/27 liner and chinstrap continued to be worn even after the M1931 liner was produced and well into the war. Many transitional helmets feature these models. 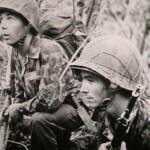 I have even seen a M40 helmet with a M1927 chinstrap. Zimmerit is a plaster like antimagnetic paste. It was applied to vehicles to deflect magnetic ordinance. Some soldiers applied this paste to their helmets and painted over it giving the helmet a rough and lumpy texture. In many cases however on original helmets what appear to be Zimmerit is actually a sand, grit or ash composition mixed directly into the paint and slathered over the helmet shell. The desired effect here was to mimic the landscape and reduce glare on the helmet. I do offer both Zimmerit or grit finish on request. What camo colors do you offer, how do you apply it? I offer all the standard camo colors found on original helmet, red-brown, brown, dark green, grass green, tan, mustard, white exedra. Camouflage can be applied both by hand or it can be sprayed. These are plenty of photographic that it was done both ways. Generally troops who fought with armored units sprayed their helmet opposed to hand painted them due to the fact that spray guns were issued to all armored units. As a point of interest, camouflage paint was issued to troops in small tins similar to shoe polish. The dry contents could be thinned with almost anything, from mineral spirits, gasoline to water. Paint was also obtained locally. Original camouflage helmet vary in appearance and color ranging from matted finishes to semi-gloss. What World War I colors do you offer? 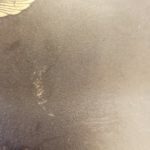 The field gray paint that was used on German M16 and M18 helmets during the World War I period differs greatly from the apple green of WWII and the field gray of the Weimar era. The Field gray I offer was match to an original M16 helmet shell. 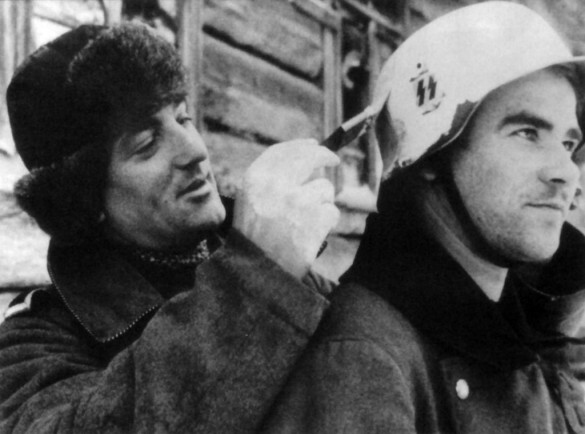 I also offer Austrian brown-gray should you have an Austro-Hungarian helmet that needs to be re-painted. Do you offer Chicken wire baskets? Yes I offer heavy gauge European single twist zinc plated iron farm wire. I have 3, 5 or 6 twist. I will also age it to your specifications. Generally zinc plated wire dulls with age, but does not rust too much. Most wire of the 1930s and 1940s was in fact zinc plated. 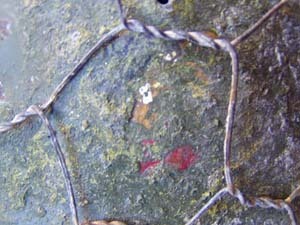 If you examine original chicken wire baskets many are not too rusty. The wire I offer is woven by hand by your’s truly and as far as I be able to tell is some of the best on the market. What other paint matches do you have? This is truly a growing list but to name a few: WWI Imperial Russian, WWI, and WWII Italian, WWI and WWII British, WWI and WWII French, and WWI and WWII American helmets. Contact me if you have questions.